DALLAS, TEXAS (December 30, 2010) With the weather cloudy and the game time temperature in the mid 60s, the Army Black Knights (7-6 Overall, Independent) downed the SMU Mustangs (7-7, 6-2 C-USA) 16-14 in the 2010 Armed Forces Bowl played at Gerald J. Ford Stadium in Dallas. The Black Knights wasted no time getting on the scoreboard early in the first quarter when Chad Littlejohn sacked SMU quarterback Kyle Padron, causing a fumble. The ball was picked up by linebacker Josh McNary and returned 55 yards for the touchdown. With Alex Carlton kicking the extra point, Army took the lead 7-0 at the 13:33 mark. They came back eight minutes later to score their first offensive touchdown on a 13-yard run by running back Malcolm Brown. Carlton’s kick was blocked to take the score to 13-0 in favor of Army. Army increased their lead to 16-0 late in the second quarter with Carlton’s attempt of a 44-yard field goal was good. SMU finally found pay dirt at the 2:56 mark in the third quarter. Pardon found wide receiver Aldrick Robinson open over the middle and connected on an eight yard pass for the score. Matt Szymanski kicked the extra point to cut Army’s lead to nine. SMU again found the end zone with 9:20 left in the game. Pardon hit Darius Johnson on a 28-yard pass and combined with another Szymanski PAT, cut the score to 16-14. Szymanski tried to give SMU the lead at the 4:10 mark in the game with a 47-yard field goal attempt. The kick was wide left, giving Army a 1st in 10 on their 30-yard line. Army spent the last minutes of the game running out the clock to preserve their first bowl victory since 1985. In that game, the Black Knights defeated Illinois 31-29 in the Peach Bowl. The Most Valuable Players of the Game were Army linebacker Stephen Anderson and SMU wide receiver Jeremy Johnson. Anderson had 14 tackles, with 10 of them being solo, combined with Josh McNary for a sack, and tallied one interception. Johnson caught nine passes for 152 yards and one touchdown, averaging 16.9 yards a catch. Army had 229 yards of total offense compared to 413 yards for SMU. The difference was in rushing yards, where Army led (199 to 111) and passing yards, where SMU held the advantage (302-30). The loss was SMU’s first in a bowl game since 1983 when they went down to Alabama 28-7 in the Sun Bowl. SMU is now 5-7-1 in bowl games, dating back to January 1, 1925 when they lost the Dixie Classic Bowl, 9-7 to West Virginia Wesleyan at Fair Park in Dallas. With the win, Army goes to 3-2 in bowl games, going back 26 years to their win, 10-6 over Michigan State in the Cherry Bowl in the Pontiac Silverdome. The bowl was only played for two years (1984 and 1985) due to a lack of financially viability. ORLANDO, FLORIDA (December 28, 2010) The Southern Indoor Football League (SIFL) announced today that the Ring of Champions Showcase (ROCS) has become their official partner for hosting league wide player combines. ROCS is comprised of former and current professional football coaches, managers and scouts from across the U.S. and Canada. With hundreds of collective years experience in pro football, ROCS produces player combines in order to collect and deliver player personnel testing and data to the league. SIFL Commissioner stated “This is a great opportunity for us to have ROCS on board as our official partner. There are no better football people in the scouting business and I am honored to be working with them again. I feel one hundred percent confident that we will receive the best available players through ROCS efforts”. ROCS is headed by CEO Bruce Cowdrey a long time arena football coach winning more championship rings than most. He has championship rings from four different professional leagues and his staff have earned over forty rings and garnered more professional players than any other organization. He and the ROCS staff will be personally testing and reporting on the players and their league potential. “It is great to be part of the SIFL and what they are trying to achieve with players. As long as I have been a recruiter I think this represents the best opportunities yet for players to get a chance to play in the pros” said Cowdrey. The SIFL/Ring of Champions Showcase kicks off their regional workouts January 15 in San Antonio, TX and continues through June at various locations across the country. For a complete listing of player combines log onto www.southernifl.com www.fanteractive.com or www.canamrocs.com . PASADENA, TEXAS (December 27, 2010) The time has come. The fans know it. The players know it. Heck, even Gary Kubiak knows it. The time for a change has come. The only question is does Bob McNair know it? The time for Gary Kubiak to step aside and give someone else a chance is long overdue. Kubiak was hired with much fanfare in 2006 as the replacement for Dom Capers. He has had a one winning season in six years, posting a 9-7 record in 2009. The kick never happened. In fact, the Texans took quite a bit of kicking themselves. After starting the season with a 4-2 record, they dropped eight of their next nine games and fell into a “funk” that no one seemed to be able to pull them out of. It does not matter whose fault it was; the players, the coaches, the owner. The ultimate fall guy is and always will be the head coach. Kubiak is not the first head coach to be “relieved of command.” He will not be the last. But the time has come to place the future of the Houston Texans in someone else’s hands. As I stated earlier, the fans know it, the players know it, and Gary Kubiak knows it. I guess it comes down to Bob McNair. He may already know it. What do I mean “may.” Of course he knows. The question is when he will decide to act? The sooner he acts; the better. There are more than a couple of NFL teams that are looking for a new head coach. He had better get cracking if he wants to get a quality coach who will take the Texans to the next level. In my mind, the best choice for the Texans would be to hire Bill Cowher. The lead the Pittsburgh Steelers to their fifth Super Bowl title and has the tools and credentials to lead the Texans. He has express an interest in getting back into coaching and if Mc Nair wants make it to the big time, Cowher may be the only way to go. I will add in another tale to the mix; how about hiring Mike Singletary as the defensive coordinator. I understand as of yesterday he is looking for a job. In any case, the sooner McNair acts, the better it will be. It will be better for the fans, better for the players, and better for the Texans. FORT WORTH, TEXAS (December 22, 2010) The Bell Helicopter Armed Forces Bowl has named General Craig R. McKinley as the honorary team captain for the 2010 postseason college football bowl game. As part of his team captain duties, General McKinley will perform the game’s coin toss prior to the 11 a.m. (CST) kickoff on Thursday, Dec. 30. McKinley will also be responsible for performing the induction ceremony at halftime for recruits present from all five branches of the military. General Craig R. McKinley is Chief, National Guard Bureau, a joint activity of the Department of Defense, Arlington, Va. As Chief, he is the senior uniformed National Guard officer responsible for formulating, developing and coordinating all policies, programs and plans affecting more than half a million Army and Air National Guard personnel. Appointed by the President, he serves as principal adviser to the Secretary of Defense through the Chairman of the Joint Chiefs of Staff on National Guard matters. He is also the principal adviser to the Secretary and Chief of Staff of the Army, and the Secretary and Chief of Staff of the Air Force on all National Guard issues. As National Guard Bureau Chief, he serves as the department's official channel of communication with the Governors and Adjutants General. General McKinley is no stranger to the home of the 2010 Bell Helicopter Armed Forces Bowl, Southern Methodist University’s Ford Stadium, as he completed his undergraduate degree at SMU in 1974, receiving his commission as a distinguished graduate of the ROTC program. He has served in numerous assignments in flying and operations, as well as command positions at group, wing, sector and field operating agency levels. 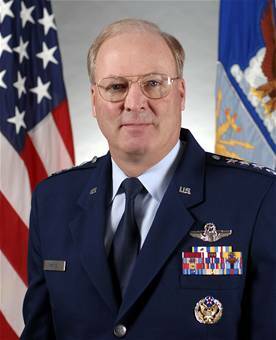 His assignments include Commander, 1st Air Force, Air Combat Command, and Commander, Continental U.S. North American Aerospace Defense Command Region, Tyndall Air Force Base, Fla. He has served as the Assistant Deputy Chief of Staff for Plans and Programs, Headquarters U.S. Air Force, Washington, D.C., and Director, Mobilization and Reserve Affairs Directorate, U.S. European Command, Stuttgart-Vaihingen, Germany. McKinley is a command pilot with more than 4,000 hours, primarily in the T-38, F-106, F-16 and F-15. Additionally, General McKinley has been pilot in command in the C-131 and C-130 operational support airlift aircraft. Prior to his current assignment, General McKinley served as Director of the Air National Guard. Owned and operated by ESPN Regional Television, Inc., the Bell Helicopter Armed Forces Bowl will kick off on Thursday, Dec. 30 from Ford Stadium in Dallas, Texas and will air at 11 a.m. (CST) on ESPN and ESPN Radio. The Bell Helicopter Armed Forces Bowl has featured a military theme since 2006 with patriotic overtones recognizing all five branches of the military throughout the game. Past Bell Helicopter Armed Forces Bowls have included fan-fest areas showcasing military hardware; flyovers; demonstrations by several of the military’s top skydiving teams; on-field induction ceremonies; military bands and honor guards; and the awarding of the annual “Great American Patriot Award” (GAPA) presented by Armed Forces Insurance. Admiral Thad Allen (Retired) will accept the 2010 GAPA award at half-time. For more information on the Bell Helicopter Armed Forces Bowl, visit www.ArmedForcesBowl.com. Bell Helicopter, a Textron Inc. company, joined the bowl on August 23, 2006 as the title sponsor of the postseason college football game formerly known as the PlainsCapital Fort Worth Bowl (2003, 2004) and the Fort Worth Bowl (2005). 2006 marked the first year for the adoption of the “Armed Forces Bowl” name, making the official title the Bell Helicopter Armed Forces Bowl. Bell Helicopter has exercised its option for title sponsorship of the game twice. The current agreement was signed September 2009 to continue the sponsorship for the 2010 and 2011 games. HOUSTON, TEXAS, (December 21, 2010) After an economic downturn had boat and camper sellers bracing for the worst, there seem to be signs of a recovery. The Houston International Boat, Sport and Travel Show, the largest indoor show of its kind in the country, will open its doors at Reliant Center on January 7 – 16, and organizers believe crowds will be bigger and will include more serious boat and camper buyers. For many years, experts have turned to boat and camper sales as an economic indicator. Several factors have resulted in a drop in boat and camper sales over the past few years, including the obvious—plummeting discretionary spending due to loss of jobs and fears about the economy in general. Also, in the midst of a record number of foreclosures, creditors tightened their belts, making it very difficult for potential boat and camper buyers to get financing. Despite this, the Houston Boat Show has ridden out the economic storm as many other boat shows in the country have shut their doors. Houston Boat Show President Ken Lovell says local boat and camper dealers have dealt with slower sales, but at the same time Houston has many more boating and travel opportunities compared to other areas of the country, "When it comes to boating, we have every type of body of water you can imagine at our backdoor. Also, Texas has very easy access to the water with hundreds of free or very low cost boat ramps, and there are plenty of storage facilities. So it's easier and much less expensive to operate a boat here. The same goes for operating a camper in Texas—you don't have to waste much gas to get to an amazing camping area." Lovell says, "We have seen so many give up their pricey vacation homes and expensive airfares in exchange for a new boat or camper, which opens the door to so many more fun and cost-effective options—close to home or out of state." In addition, he says creditors, suffering from a decline in car sales, have loosened their restrictions on boat and camper financing. HOUSTON, TEXAS (December 21, 2010) Leaving the court at halftime trailing by three points, the Houston Cougars (7-5, 0-0 C-USA) came back, winning a close game, 75-73 over the Sam Houston Bearkats (6-4, 0-0 SLC) at Hofheinz Pavilion in Houston. This game gave the Cougars a 2-0 record this season over the Bearkats, extending their lead over Sam Houston to 26-6 all-time. Houston beat the Bearkats 75-71 on December 4 in Huntsville, with the game decided in overtime. Rebounding and free throws were the key to the game, with Houston hitting 17 of 30 from the line, while the Bearkats hit 20 of 28. Adam Brown led the Cougars with 21 points and six rebounds, while Maurice McNeil chipped in 18 with nine boards. Rebounding was again a problem for the Cougars, with three players; McNeil, Brown and Kendrick Washington (six rebounds) accounting for 21 of Houston’s 34 total rebounds. The Cougars could manage only eight offensive rebounds, with McNeil, Brown and Washington accounting for seven of the eight. The Cougars must hit the offensive boards with more aggressiveness if they want to survive their upcoming C-USA matchups beginning January 5. Southern Mississippi is averaging 45.4 rebounds per game, which is ranked fourth in the nation while Marshall has a 40.9 average per game. The Cougars will play Southern Mississippi at Home on January 5, while having to wait until February 1 to meet Marshall. The Cougars will have off until December 26, when Houston head coach James Dickey stated his players would be back in Houston for practice. The Cougars will next face Rogers State on December 30 with a 6:00pm start. This will be their last non-conference game before kicking off the C-USA schedule on January 5 against Mississippi State. The Bearkats will next face Air Force on December 28 in El Paso at the Don Haskins Sun Bowl Invitational, followed by Western New Mexico on December 29. HOUSTON, TEXAS (December 21, 2010) Ticket sales for the 2010 Texas Bowl have surpassed 60,000, the Texas Bowl Committee announced today. With the game eight days away, less than 10,000 tickets remain available for purchase. The 2010 Texas Bowl will kick off at 5 p.m. CT, Wednesday, Dec. 29. It will be televised on ESPN and can be heard nationally on ESPN Radio and locally on ESPN 97.5 FM. The game will feature Baylor and Illinois in the first year of the bowl’s new matchup between the Big 12 and Big Ten. Baylor finished the year 7-5 and will be making its first bowl appearance since 1994, while Illinois returns to postseason play for the first time since the 2007 season after a 6-6 season. The Texas Bowl, which is owned and operated by ESPN Regional Television (ERT), Inc., a subsidiary of ESPN, held the fifth choice among non-BCS bowls in each conference. Baylor will be the designated home team for the game. Tickets went on sale to the general public on November 1 following an exclusive pre-sale window for those who bought tickets to the 2009 Texas Bowl. Tickets, which start at $30, may be purchased online at TicketMaster.com, on the phone at 832-667-2390 or in person at the Reliant Stadium box office inside Budweiser Plaza. Game tickets will also grant fans admittance to TexFest, a Texas-sized pregame party featuring a live performance by popular Texas country artist Roger Creager on the Bud Light Stage, as well as “Spirit Walks” when the teams arrive. The Texas Bowl has been a tremendous success both on and off the field over its first four years. The bowl has generated an average of $25 million per year for the Houston economy. The bowl has over 25,000 season ticket holders and sold over 50,000 tickets before its teams were announced last year. Over its four-year history, the Texas Bowl has donated over $300,000 and more than $5 million in promotional support and publicity to DePelchin Children’s Center, the bowl’s official charitable beneficiary. Waste Management named first “green” sponsor, Nissan official automotive sponsor. HOUSTON, TEXAS (December 20, 2010) The Houston Marathon Committee is excited to announce its new 2011 sponsors: Waste Management, Nissan and global law firm King & Spalding. Houston-based Waste Management, a leading provider of comprehensive environmental services in North America, is the first official “green” partner of the Chevron Houston Marathon. Committed to helping reduce the event’s environmental footprint, Waste Management will provide recycling receptacles during race weekend and will also perform a waste audit to help expand the Committee’s green initiatives for future events. In addition, Waste Management’s “Green Squad” will support the marathon with a team of volunteers. Nissan, the new official and exclusive automotive sponsor of the Chevron Houston Marathon and Aramco Houston Half Marathon, will provide official vehicles for the 2011 races. "This marketing partnership is an ideal way for Nissan to bring the new 100% electric Nissan LEAF to Houston's active lifestyle community and connect to consumers in a way that aligns Nissan with their passions," said Jon Brancheau, Vice President, Marketing, Nissan Division. More information on Nissan in North America can be found online at www.NissanUSA.com. In addition to Waste Management and Nissan, King & Spalding, a full-service, global law firm with offices in Houston, joins the team and will provide reusable goodie bags for more than 30,000 race participants. The Chevron Houston Marathon, Aramco Houston Half Marathon and El Paso Corporation 5K will be held on January 30, 2011. To learn more about Houston Marathon Committee’s sponsors and its green initiative, please visit the event website houstonmarathon.com. SAN MARCOS, TEXAS (December 18, 2010) The San Marcos Academy Bears got an early holiday present as they moved up this week to number four in the latest poll of the Texas Basketball Coaches Association of private schools. The Bears are off to a fast start, and currently stand at 14-2 for the season. The team, 2-0 early in district play, is riding a 4-game winning streak. The Bears have swept both the San Antonio Lutheran Tourney and the Sunnybrook Christian Lions Hoops Tourney with a 6-0 record in both tournaments, taking home two championship trophies and two MVP awards. The latest ranking is the highest since the early 1980’s then the Bears joined the Texas Association for Private and Parochial Schools. The Bears are rolling under the leadership of SMA Head Coach Kelia Price, the perimeter play of junior guard John Nealon from Wimberley and the inside play of Currie Pipkins, Sabas Castillo and Dion’drick McCoy, all of San Marcos. The holidays may be a welcome break for the Bears, but may be a challenge for continuing the steady improvement they have shown as they now go for more than four weeks with no games. When they return for the spring semester, they will immediately have to face the always-tough Austin Regents, a team fresh off a state championship season in football. The SMA Bears will return to action after the holiday break with a district contest on January 11th on Chick-fil-A Court as the Knights from Austin Regents pay a visit. HUNTSVILLE, TEXAS (December 4, 2010) The Houston Cougars (4-3, 0-0 C-USA) hit the road for the fourth time this season to face the Sam Houston State Bearkats (4-1, 0-0 SLC) with a 2:00pm game time in Saturday. Just a stone’s throw away Sam Houston’s grave, the Cougars and the Bearkats take to the hardwood at Bernard G. Johnson Coliseum, with Houston coming off a 73-57 drumming from LSU in Baton Rouge on Nov. 20. Sam Houston, the defending Southland Conference champions, is coming off a 54-46 win over St. Thomas. Their only loss this season was to Texas, 84-50 in Austin. The Cougars own a 24-9 (.727) lead in the all-time series against the Bearkats, which dates back to Jan. 17, 1946. Houston has won the last two and four of the last five games against Sam Houston and post a 10-4 (.714) all-time record in Huntsville.